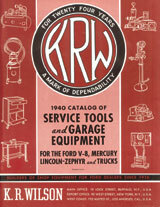 This reprint of the 1936 KR Wilson catalog shows the tools used by Ford mechanics. 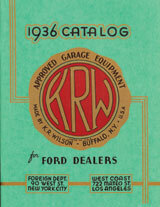 Thought to be cutting edge technology at the time this book provides a nostalgic look at the tools used on V8 Fords and others cars of the 1930Ã¯Â¿Â½s. An incredible listing of tools, pictures and there use. A great gift for any Ford V8 car or truck owner. Covers 1936-1940 104 pages with numerous illustrations.